Discussion in 'Electrical Codes' started by ICE, Nov 23, 2017. Is there a standard procedure to be followed when inspecting a terminal torque? More often than not, the hardware is torqued and when a wrench is applied it indicates that the hardware is at or above the specified value. There is also an approach whereby the hardware is tightended under the specified value and the test sets the correct torque. It’s reasonable to assume that there is written instruction on the subject that can be referred to. So be a Peach and send me in the right direction. She was always willing to set me straight. Haven't heard from **the Peach** in a long time. How can the inspector implement verification of proper torque ? Santa Ana, California is included in Exhibit 1.
the torque values on their torque tools. Which connections should be torqued ? be re-tightened to an appropriate torque value. showing the date the calibration was done. wiring.......Always check the manufacturer’s installation instructions. This information is only one Link out there on the "world wide webby." Tiger, do you want more info ? Thanks North Star. My choice is method number two. It would be great to find a few more jurisdiction requirements. When the inspector came for a service install I was in the process of torquing the entrance conductors. He said he had never seen anyone use a torque wrench. Michael.L, Joe Engel and cda like this. I have never seen an electrician torque any electrical connections, and I've built everything from supermarkets, to two cyclotrons, and one single family home with an 1,100 amp main service. I wouldn't miss it, as an owner of several airplanes I am familiar with mechanics torquing nuts and bolts. Looks like our Tiger has done it again, he has figured out a way to drive construction costs even higher, maybe the ICC could establish a yearly award and name it "The Tiger Award" for the inspector who establishes the most innovative way to increase costs. Well then conarb, I doubt that the cost of doing business ever got in your way. I always require a torque wrench test on commercial electrical equipment. A strict application would cause all residential electrical to be torque tested. And trust me with this, residential is loosey goosey. Having built more airplanes than you've owned, I too know a thing or two about nuts and bolts. The average electrician, not so much. 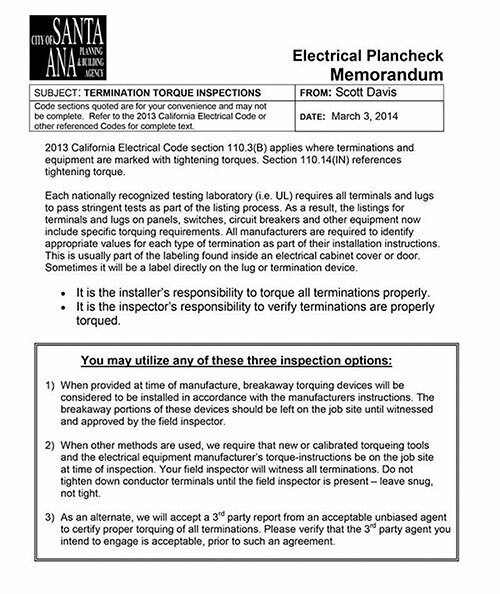 Unless forewarned, electricians button everything up and request an inspection. I show up and ask for the torque wrench that they don't have. Not a problem...we'll meet again soon. At the next attempt we set the torque wrench and go to work. Invariably I am told that the terminals were uniformly loose prior to my intervention. Several contractors have told me that the terminals were so loose that they are concerned about the jobs that they have done in the past.... That's how loose they are.....losing sleep loose. Alright Tiger, here are three more Links to information on Torquing. San Diego Chapter.......You may want to contact them for their procedures. Some good information in all three Links. Ensure your electricians own and know how to use a torque wrench. When all else fails read the instructions. On more than one occasion they provided a ft.lb. wrench for an inch lb. torque..... or they have the wrench still in the wrapper hoping that a different inspector shows up and doesn't require a torque test....that way the wrench can be returned to the store. Too often they lack the allen head or socket that fits the hardware. There won't be any advance work to write down the torque values for each different size terminal.... so I waste time while they find that out. And then there's the cheapest wrench available....it has a pointer. i have had to show them how to hold a terminal lug with a wrench or pliers to keep from ripping it loose. Sometimes I have to drag a job into compliance. The only torquing I see done on jobs is by the Special Inspector inspecting structural steel, I've watched them and they log all the values as they torque the bolts and nuts, copies of their reports are given to the structural steel contractor along with me, I then give copies of all special inspections to my structural engineer and the field inspector. Torque logs go right along with weld inspection logs and UT logs. I recently found loose nuts on an entire post to beam connection, I made the steel contractor come back and tighten them up but didn't insist on torquing them. I've been an inspector for several years and have not been asked by any BO above me to enforce this requirement. I see a lot more issues in the box than this. Is there any truth that Aluminum SE is the reason for this requirement due to shrinkage? In large commercial jobs I tell the electrician that I will be expecting them to torque connections. I like to see the tools and I have them mark the terminals that they are torqued for my inspection. Sometimes on large voltage I like to witness the torquing. Just witnessed one on a 45,000 v transformer a few days ago. Any loose electrical connection can cause a high resistance fire. Picking on the Canadians and this is a wire nit connection. Joe Engel and tmurray like this. I believe that this became a concern after problems with the use of aluminum wire. The problem is that aluminum is more likely to creep thus resulting in a loose connection. A improperly torqued copper connection is just as bad as a improperly torqued aluminum one. This is the solution to your screw driver problem, demand that the electrical contractor (or solar contractor) be there with a torque wrench to show you that the connections are properly torqued, in the meantime buy stock in companies that make torque wrenches. Some percentage of electrical connections never see a torque wrench. With residential that would be 100%. So does it really matter or is torque requirements a result of engineers being in charge? With non-residential and I've come across many that were loose or too tight. Many inspectors don't even mention torque; so rest assured that lots of installations are loose or too tight. I'm not hearing about connections bursting into flames. Several contractors have become concerned about their past work once I introduced them to the concept. "Way loose" was a term they used. One guy said that he was losing sleep over it. At my last job, I oversaw the construction of a 1MW solar system at an industrial location. The contractor hired to do the job was a real piece-of-work. He didn't have a firm grasp of the electrical code, had his crew do lots of "wing-it in the field" installation techniques. Didn't have many of the necessary specialized equipment needed for the job, including not having a torque wrench. When they suddenly had to do some torque demonstrations of the solar panel framework fittings for the design engineer, they had to borrow one of my personal torque wrenches. I was not pleased. After the system was completed and they left the job, we started having issues with one of our 250KW central inverters. After hours of testing and troubleshooting, I discovered the problem to be a loose connection in an electrical terminal. I ended checking all of them and none were properly torqued. fatboy and ICE like this.